Likely one of the biggest vehicles heading to Tokyo, the Sora offers seating for 79 people. Much like the Fine-Comfort Vehicle unveiled earlier today, the new Toyota Sora adopts a fuel cell powertrain and is a concept. This is where the similarities end as while the former is a six-seater sedan, the latter aims to see into the near future of public transportation. 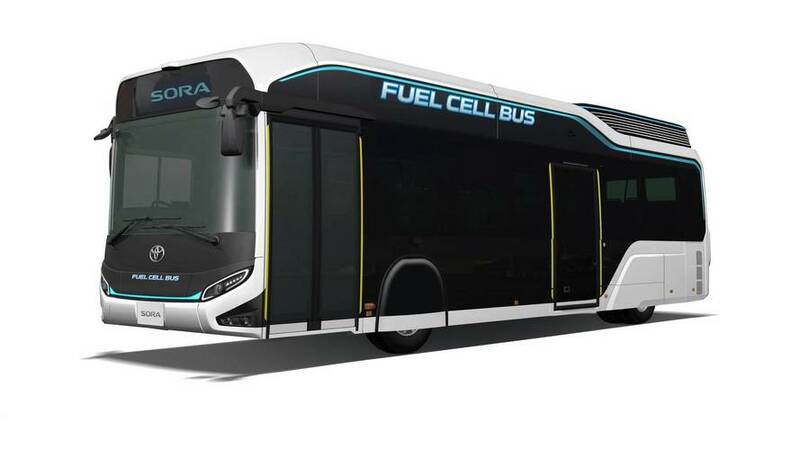 It’s more than just for show as the bus will actually spawn a production version as early as next year when more than 100 units will be deployed onto the streets of Tokyo's metropolitan area ahead of the 2020 Olympic and Paralympic Games. If you’re wondering about the name, it’s an abbreviation of the words “sky,” “ocean,” “river,” and “air” as a nod to the earth’s water cycle to bridge a connection with the concept’s Mirai-derived fuel cell setup that emits only water. The new bus is able to accommodate up to 79 people (22 seated, 56 standing, and the driver) and comes equipped with no less than 10 high-pressure hydrogen tanks. Compared to conventional buses that have a boxy body, Toyota wishes to point the Sora has been designed with a stereoscopic shape to make it stand out. LED headlights and taillights lend the concept a high-tech look, but it’s the interior that truly sets it apart from the current crop of buses roaming the streets of Japan’s capital. The Sora is the first bus in Japan to feature eight HD cameras installed inside and outside to monitor everything that’s going on around the bus. Whenever something is detected, be it a bicycle or a pedestrian, the driver receives visual and audio warnings. Another premiere for a bus from the Land of the Rising Sun is the acceleration control function that surpasses sudden acceleration to guarantee a smooth acceleration at all times. The Sora also marks the debut of an automatic arrival control system in Japan as the bus is smart enough to detect the guidance line on the road to automatically steer and brake the bus with around three to six centimeters (1.1 to 2.3 inches) from the bus stop and within 10 cm (4 in) ahead of or behind the bus stop position. Toyota says this feature particularly helps with loading and unloading wheelchairs and strollers. As a refresher, the Tokyo Motor Show will kick off October 25th, so in a week from today. 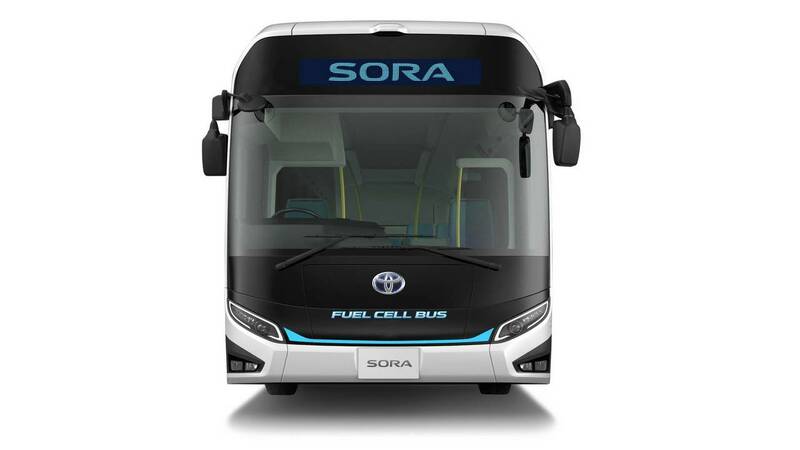 Toyota City, Japan, October 18, 2017―Toyota Motor Corporation (Toyota) announces the launch of the "Sora1," a Toyota fuel cell bus (FC bus) concept. Toyota plans to launch sales of a commercial model based on the concept vehicle in 2018 and expects to introduce over 100 Sora, mainly within the Tokyo metropolitan area, ahead of the Tokyo 2020 Olympic and Paralympic Games. Toyota developed the Sora (concept model) based on the vision of an "enduring town icon" guided by two ideas: to make best use of the characteristics of the FC unit; and to enhance the comfort of passengers traveling on bus routes. The design pursues stereoscopic shaping that significantly differs from the hexahedron (box shape) of conventional buses. It also uses LED for the front and rear lights. Such design features make the FC bus instantly recognizable. Toyota plans to display the Sora (concept model) at Tokyo Big Sight during the 45th Tokyo Motor Show 2017. The theme for this year's show, which runs for 12 days from October 25 to November 56, is "Beyond the Motor."